Galia melon	Galia melon, also known as Sarda(Urdu) in Southeast Asia, is a hybrid melon originally Developed in Israel. They are not particularly difficult to grow. Galias are now grown in Brazil, Portugal, Spain, Morocco, Southern U.S. regions, Costa Rica, Panama, Honduras, Greece, Turkey, Israel and Egypt. Galia Melon is also grown in large numbers in Pakistan and usually the weight ranges from 1 Kilo to 8 to 10 kilos apiece. 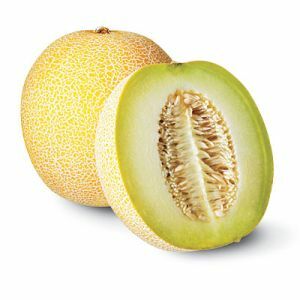 The average weight for a galia melon is one kilogram. They have a rounded shape, a dense netting of rough line on the skin, become yellow at full maturity, they are sweet and aromatic, with a special aroma and flavor and a very high content of total soluble solids. Ripeness is measured not by softness at the stem but rather by color and fragrance. Left at room temperature, Galias keep well, but after cutting, uneaten pieces should be wrapped and refrigerated to preserve taste.